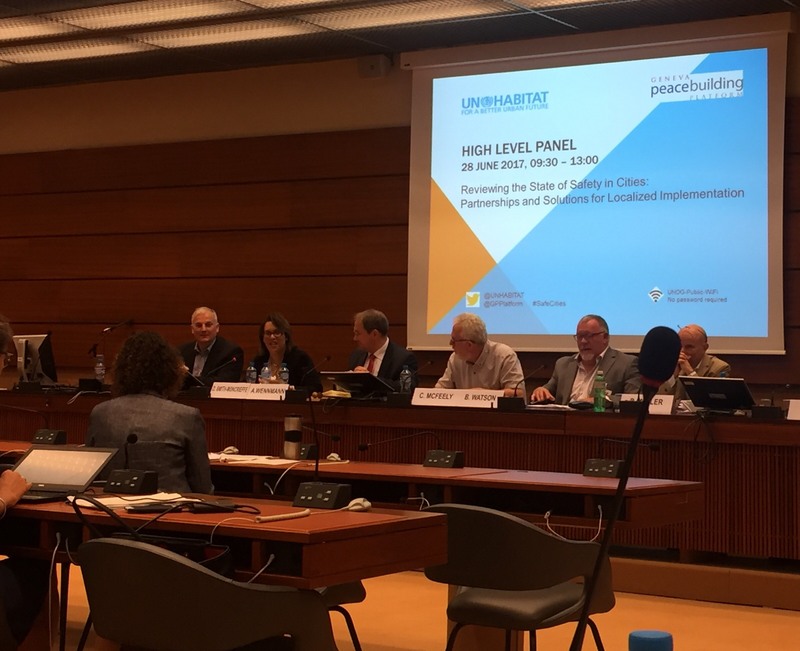 Organized by UN-Habitat and the Geneva Peacebuilding Platform, a very interesting Panel Discussion on “Reviewing State of Safety in Cities”, was held on June 28th in Room XXV of Palais des Nations. This event was organized in the scope of the outcomes of the UN “Habitat III” conference, resulting in the “New Urban Agenda”, and to facilitate partnership between local and national governments, civil society and other stakeholders to fully endorse the Sustainable Development Goals for 2030. During the Panel, it was examined how nowadays’ speed of urban development brings environmental and social challenges which need to be addressed with a holistic approach. The panellists discussed the need to prevent crime and violence against woman – as they do not feel safe in cities; to counter radicalization of marginalized urban youth and counter urban terrorism as well as address politicization of migrant flows. Those seem to be the upcoming challenges that local governments will need to face in the following year, in megalopolis as well as in middle-sized cities. Often, these challenges in urban areas are the result of a poorly planned urbanization, causing not only crime and terrorism, but also internal displacements. Also in the scope of implementing the SGDs, the panellist convened that these trends need to be solved through proper urban planning, legislation, and good governance. Among the possible solutions presented, it was extensively discussed the need to decentralize security policies, bringing them from a national to a local level, and to involve mayors and municipalities in the decision-making process, as they are the authorities which know better the structure, the issues, and the challenges of their community. Even the SGDs, mainly government-focused, need to be interpreted from a local point of view in order to effectively implement Goal 11 particularly. It was also recommended to boost police work everywhere in order to make cities safe, especially in those countries in the Global South where law enforcement authority is deinstitutionalized and communities rely on “informal” authorities – such as neighbourhood chiefs, for example, in francophone Africa – in order to solve conflicts. To implement security within cities, the key is to implement social inclusion of marginalized groups from the peripheries, also through digitalization, and enhance partnership with the private sector and civil society. Panel discussions such as this are very important spaces where we, the civil society, can actively have a saying in discussing public policies which dramatically affect the extent of our work in the field.